"Whhhhhhhhhhheeeeeeeeeewwwwwwwwwwwww..." That's the sound of me chasing the White Rabbit. 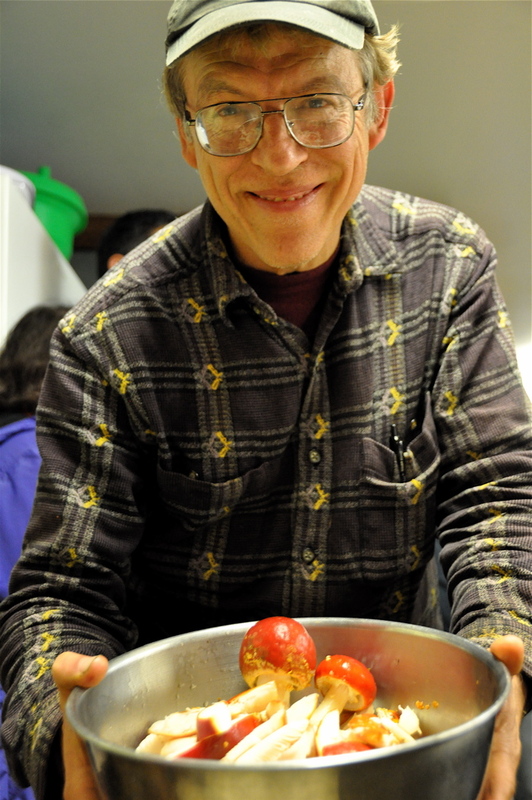 And there before me, with a Cheshire Cat grin, is my bespectacled host, holding a platter of not-your-everyday food steaming in the kitchen of the Albion Biological Field Station. 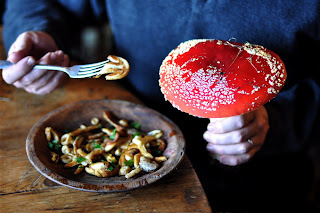 Any trip to Mendocino County can feel like something dreamed up by Lewis Carroll, but when it involves a half-dozen or more species of wild mushrooms that have never met this blogger's taste buds, including the iconic fly agaric—the pyschoactive mushroom rumored to have inspired some of Carroll's magical mayhem in Alice in Wonderland—the scene is set for a tea party of Mad Hatter proportion. But we are not here to do psychedelics. We are here to learn about fungi—and eat. My host is mycologist David Arora, author of the celebrated field guide Mushrooms Demystified. Arora has been a fixture on the mushroom hunting scene for four decades, and for the past 20 years he's put together a Thanksgiving weekend event in the coastal California town of Albion, just south of Mendocino. 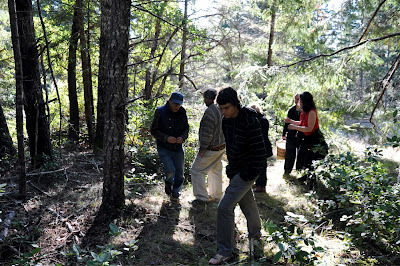 Two days of forays are capped by an evening of extensive tasting, with everyone involved in the "woods to plate" drama. The kitchen is warm with gas burners and camaraderie as each student pitches in to help. Attendees clean, prep, and cook dozens of species of edible mushrooms, including several species I've never eaten before: the midnight blue entoloma (Entoloma bloxamii), amethyst laccaria (Laccaria amethysteo-occidentalis), and beefsteak mushroom (Fistulina hepatica), which looks like fillet mignon when sliced open. More than any other species, though, Arora is known for serving his guests Amanita muscaria. This practice is not uncontroversial. Amanita muscaria, also known as the fly agaric for its ancient use as a pesticide, is generally considered by English-language field guides to be a dangerous toxic mushroom. It’s been documented as a hallucinogen and used as a drug by social groups as varied as middle-class American hippies and Siberian reindeer herders, and occasionally it’s implicated in deaths, though not directly. In one recent case a victim ate the mushroom for its psychotropic effects and died of hypothermia. But, as Arora points out in his workshops, Amanita muscaria is also used as food. 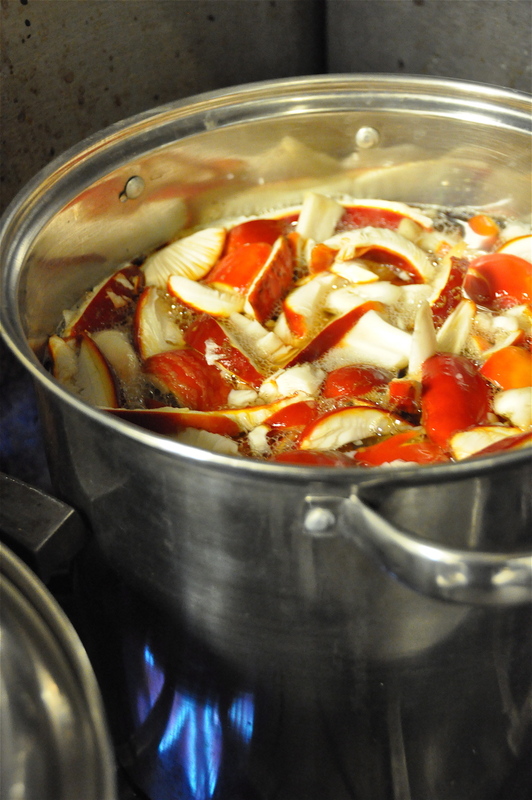 It turns out the mushroom can be easily detoxified and consumed. Still, many mycologists object to such teachings. Michael Kuo talks about "Amanita bravado" in his book 100 Edible Mushrooms, suggesting that novices might be tempted to sample dangerous mushrooms out of peer pressure. Arora scoffs at this notion. 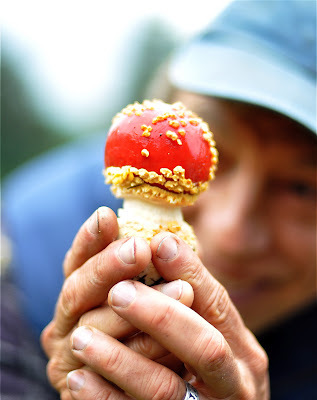 For him, the use of Amanita muscaria as food is simply a case of scientific research triumphing over prejudice. He cites two main reasons for serving it: First, "to introduce people to the huge menu of edible and delicious mushrooms available if we would but open our minds. "And second, that the classic form of Amanita muscaria—red cap with white warts—is among the easiest of organisms to identify, and while there is risk in preparation, there is no risk in identification. As to the risk, he points out that red kidney beans are also quite toxic raw and even more toxic when undercooked, and humans eat numerous other plants and vegetables that require careful processing to be edible (e.g. tapioca and pokeweed). Besides being strikingly beautiful, Amanita muscaria can be a large mushroom and in certain locales quite common. These qualities make it an attractive choice. More importantly for the table, it's also quite flavorful, with a firm texture and a sweet nutty taste that is unlike other mushrooms. Despite being sliced up and boiled in a large vat of water for 15 minutes (the main toxins are water soluble), the drained mushroom sautés up nicely, crisp and slightly browned. When I told a commercial picker that I had tried Amanita muscaria and found it tasty, he replied "So are scorpions! Not worth the effort." Arora is undeterred. "What effort?" he asks. 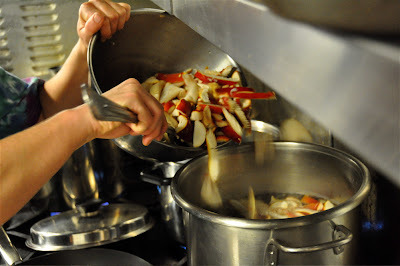 "The effort of carrying a pot of water from kitchen tap to stove? The effort of slicing up the mushrooms? And if extra effort is to be avoided, then why go foraging in the first place when you can buy food at a corner store?" If you’re interested in eating Amanita muscaria as food you must first do your homework. When not processed properly, these mushrooms can be dangerous, unpredictable, and result in a trip to the hospital—not just a bad trip. First, read William Rubel and David Arora’s paper from Economic Botany, "A Study of Cultural Bias in Field Guide Determinations of Mushroom Edibility Using the Iconic Mushroom, Amanita muscaria, as an Example.” Then read Lawrence Millman and Tonya Haff’s account of an accidental poisoning, "Notes on the Ingestion of Amanita Muscaria," to see what can go wrong, and why. Some believe that it's irresponsible to even talk about the potential edibility of Amanita muscaria, especially considering our own species' propensity for faulty reasoning and bad decision-making. After all, the Amanita genus is home to some of the most toxic mushrooms on the planet, including the Death Cap (Amanita phalloides) and Destroying Angel (Amanita ocreata et al). Obviously this writer feels that ignorance and stupidity are not good enough reasons to censor a discussion about using Amanita muscaria as food. That said, my own interest lies elsewhere. Most days I'd rather see the colorful fly agaric on the roadside than in some curious forager's soup pot. But I find it incredible that a mushroom eaten around the world can be so vilified in our own culture where a box of Fruity Pebbles is kept on the supermarket shelf at eye-level for five-year-olds. Who's nuttier—the people who eat Amanita muscaria for food, or us? AWESOME!!! Love Mendocino, love David Aurora's books/knowledge and loved your post here. Where I live there is so many amanita muscaria that you could fill up a truck! Reading this brings me back to Mendocino and foraging for delish edibles. thx! Great post. So fascinating-and liberating-to think that there is so much more to all those beautiful amanitas than an object lesson in fungal toxicity. Bravo for bringing this to our attention. I look forward to trying them out next year. Great piece! Can't wait for part 2!! Looks so beautiful. Waiting for part2. This is very bold thing to do. Isn't there a saying about bold mushroom hunters and old mushroom hunters ? : ) They are a beautiful mushroom to behold though. That article of Arora's is a favorite of mine, and I'm envious that you went to the annual Thanksgiving festivities. I don't think eating Amanitas properly prepared under the watchful eye of an experienced hand like Arora is "bold," any bolder than eating scarlet runner beans. I'd try it. Did you? 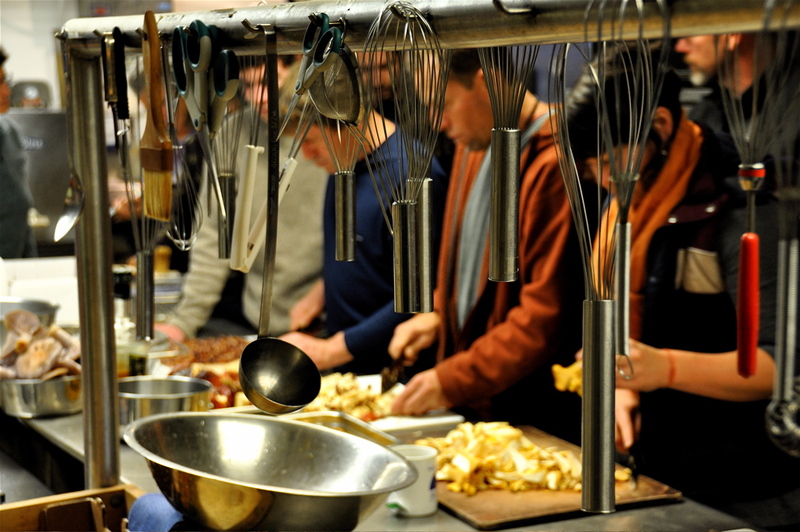 Did you forward this link to your friends from the Cascade Mycological Society? I have a feeling you won't get such a positive reaction from them, you crazy risk taker you. Thinking I'll give the muscaria a try next season - I've read Arora's article several times and this first hand account helps seal the deal for me. Jeffery - It's been years since my last visit to Mendo, and all I can say is, been too long! Weareallantropologists - Nice handle. Probably doesn't need to be said, but I'll say it anyway: Use caution and do your homework first. Sean - See my comment above. JoAnne - I hear you. Then again, probably the boldest thing most of us ever do--and routinely at that--is drive on a highway. At least with A. muscaria, any mistakes in processing are your own. Bikejuju - I've never eaten scarlet runner beans--do they require careful prep? Interesting....when I was a kid, I swore I would NEVER eat wild mushrooms after a grim dinner party was all over the news in Portland. A group went out and foraged wild 'shrooms (not sure what they were seeking and got)and after their subsequent dinner, I think 4 of them died quickly, another had to have a liver transplant. (in the 1970s I think.) I have outgrown that phobia and enjoy morels and chanterells, but haven't ventured much beyond. This one sounds a little more exciting than I would venture to taste. but cool post and photos! And yes, I'm sure there are a lot of things we eat commonly that have nastier cumulative effects on our health. Enjoyed meeting you up at NCI ELC in November! Langdon does the boiling remove all the psychodelic properties? So, what did you think of those Laccaria amethysteo-occidentalis? I cooked some up this past Summer , and they tasted like dirt, in a bad way. But these are the Eastern ones; maybe yours are different? I thoroughly enjoyed this post! Amanita muscaria is extremely common in the Ithaca, NY area where I live, but we have the yellow var guessowii instead of the red version you have out West. I have heard it contains the exact same toxic chemicals, so I assume the same parboiling method would work. Still, I'm a bit afraid to experiment without confirmation - has anyone tried parboiling the yellow capped A. muscaria? By the way, I totally agree with David Aurora that this species is worth eating, assuming you know how to safely prepare it. The much riskier form of mushroom hubris is eating a pretty mushroom whose identity you are only 98, but not 100 percent sure of. That can result in death in the worst case scenario. A. muscaria, on the other hand, is extremely safe to ID, and even in the worst case scenario described in Lawrence and Tonya's article, the results are far from fatal. In autumn everyone in Lithuania goes to forests for mushroom hunting. Unfortunately each year few people die, after they had wrong mushrooms. Last autumn one man has died - he wanted to prove, that he could eat agaric and nothing happens to him. Oooops, he was wrong. Just giving your readers a bit more food for thought. My lengthy, thoroughly-researched, peer-reviewed article on this topic is now available online from the latest issue of "Mushroom, the Journal of Wild Mushrooming." Its title is: "Further Reflections on Amanita muscaria as an Edible Species." BTW, congrats on your new book!